Occasionally, something really cool turns up on my front porch. 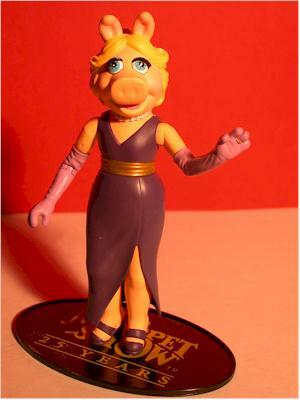 This week, something really, REALLY cool turned up - the Miss Piggy figure from the first series of Muppest by Palisades Toys. Some are calling this line the next WOS, but only time will really tell. What is certain is that both action figure collectors and Muppets fans alike are excited about this release. The first series includes Dr. Teeth, Miss Piggy (reviewed here), Bunsen Honeydew and Kermit of course! There will also be play sets, and the first is Honeydew's lab with a special Beaker figure. Retail for these should be around $8-$10. Toys R Us will be carrying them in a big way, along with other specialty retailers. 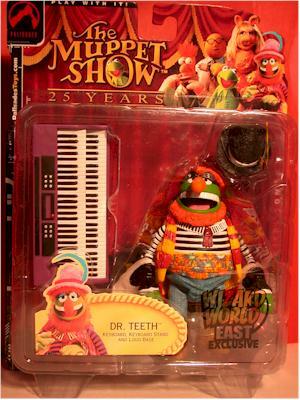 We're likely to see quite a number of exclusives, and the first has already been released - a repainted Dr. Teeth, exclusive to the Wizard World East show. There's a photo of him just below. Electronics Boutique will be carrying an exclusive Miss Piggy, which is currently available for pre-order, and Toys R Us is carrying the exclusive Tuxedo Kermit. While Toyfare has also solicited the Tuxedo Kermit, if you didn't get it that way don't fret. Toys R Us will have 90% of the run available through their stores. 2015 Update: I updated both this and the review of the Dr. Teeth, Kermit and Bunsen Honeydew at the same time. I didn't want to split the first wave up, at least not in terms of the current layout update. I don't know that this series became the next World of Springfield, simply because it didn't produce quite as many figures over quite as many years. But as much as I love WoS, the Muppets line from Palisades was the overall winner for me. The attention to detail, the cool accessories, the high quality paints and sculpts, the well designed articulation - the entire concept was a winner from beginning to end. If there was one weak link, it was Piggy. I don't think we ever got a truly perfect example of her character, unlike Kermit or Fozzie, but it's a minor nit in an otherwise stellar series. You can still pick up most of the individual figures - at least the regular releases - for a reasonable price, but I don't know what the effect of the new show may be. If it does well (and initial ratings are solid after two weeks), it may create a renewed interest in all things Muppets and drive up the ebay prices for these figures. My last review of the Scooby figures was fine example on how NOT to do carded figures. Here's a fine example of how to do them. The art is very attractive, and specific to the first series. You see the first series of figures on the front, along with the red curtain design similar to the show. Palisades web site info is prominent, along with the admonition to "Play with it!". On the back there's further pictures of the rest of the line, with bio info on Miss Piggy and general info on the show. This is a terrific example of great text and graphics on a sturdy card. The sculpt is dead on. The size of the snout, the placement of the eyes and ears, and even the body, which we rarely got to see in its entirety, are just about right. 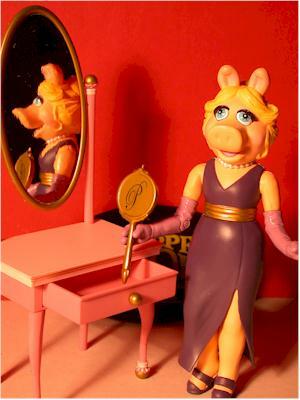 After spending many hours (okay, not quite that long) staring at Miss Piggy and comparing her to photos, I do think the snout is a little too large. I took a slight bit off this category because of it, but it's not too far out of proportion for her face. It does seem to me that Miss Piggy had a slightly bigger bust line than this, although I'm not sure I should even be noticing that. Some folks won't like the short hair on this particular sculpt, but the EB exclusive is the longer haired version. The hands are also great sculpts, and the left hand is designed to hold the hand mirror perfectly. It's always nice when a figure can actually hold its accessories - it's surprising how often that's not the case. The paint ops are extremely good, but there is a little slop here and there. The paint work around the face, particularly the blush, eyes and hair line are all quite well done. There was some 'crud' in some of the paint, giving a couple bumpy areas around the ears, but overall the head was great. Some of the lines on the body, particularly around the shoes, were a little uneven, so pay some attention when you pick yours out on the pegs. Overall the paint ops are as good or better than other figures in this scale and style. 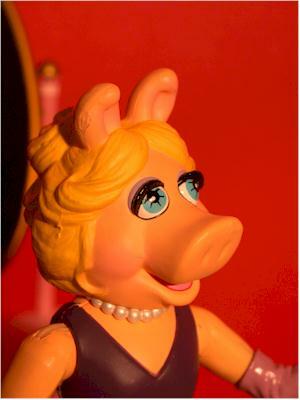 Even though she only has 8 points (10, if you consider each ball jointed shoulder as two points), Miss Piggy is about as articulated as you could expect. She has neck (which has a good range of motion since her hair is short), ball jointed shoulders, cut joints at the very top of the gloves, her right elbow, and hips. Knees and ankles probably wouldn't have done much, but a waist joint and the left elbow would have been good to add. 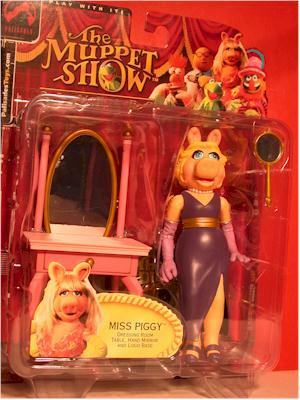 Miss Piggy comes with three items. First, there's the stand that every figure will come with. It has the Muppet Show logo, with the 25th anniversary mentioned. There are two pegs, one for each of her feet, and she fits perfectly. She could also stand on her own, but she's easy to knock over due to her small feet and, uh, classic proportions. Then there is her trademark mirror. On the back is an intricate 'P', and the mirror itself actually reflects. 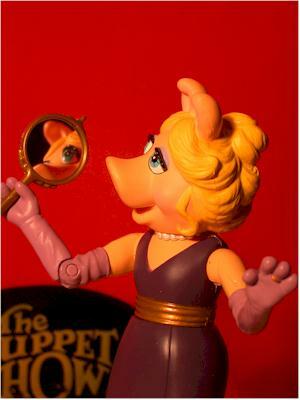 Sure, it's just a sticker, but at least Miss Piggy can use it to check her eyeliner. It also fits neatly in her right hand. The final accessory is the largest - her makeup dresser. There's a large mirror on top that tilts to any angle, with the same reflective sticker material. The lower half includes a drawer that opens - an extremely nice touch that I hadn't expected. I'm assuming you'll find her for $8-$9. WOS figures are still around $6, and although these come with more complicated accessories, I'd still like to see them around $7. Still, it's an awfully nice figure with some great accessories, so $8 or so isn't bad. 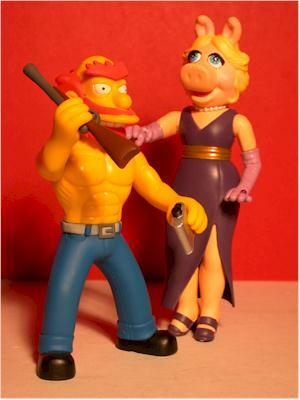 Miss Piggy was awfully close to 4 stars, and I suspect that every figure in this first series will end up between ***1/2 and **** for me. This is a fantastic line, and I'm betting that the Muppets fans will gobble them up. If you have any inclination that you might want to get this line, start picking them up right away. You can always return them, or sell them off to another collector later. Pre-order those exclusives, or pick them up at the store when you see them. Don't make the same mistake that so many WOS collectors did and wait until the early figures were already 3 or 4 times their original price before trying to find them. I don't know of a store with these in stock yet, but lots of places are taking pre-orders. Bricks and mortar Toys R Us stores and Target stores should have them soon as well. You can also search ebay for a deal. This is the first review of the Muppets series. You should hit the Search Reviews page to find any other applicable reviews that were done after this one was published.